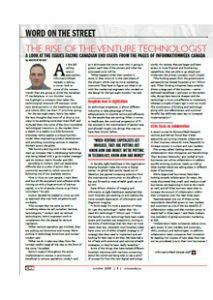 The Rise of the Venture Technologist – published in CRN Magazine – Nytric Ltd.
As the fall selling season approaches, InformationWeek Canada is taking a closer look at some of the newest trends that are going to drive the Canadian IT marketplace. In our October issue, we highlight a company that takes the technological pressure off startups; some new developments in the healthcare vertical; and where CEOs see their IT priorities going. For the last eight years, Nytric has taken the very thoughts that most of us shun as too crazy to be anything more than brain fluff, and nurtured them into some of the most innovative technological inventions on the market. From a sketch on a napkin to a fully functional prototype, Nytric applies a unique business model when engineering product development and providing consulting services to creative thinkers across the globe. “We found a very big void in the way that a start up company that is developing technology was being helped with a go-to-market strategy,” said Av Utukuri, Nytric founder and CEO. According to Utukuri, start ups experience difficulty due to a plan of action that is commonly resorted to, which consists of following one of two available options. “One is I hire my own people, I train them and buy all the equipment and software while coming up with a huge amount of start-up capital, or a lot of people choose to go find a consultant,” he said. Utukuri decided he needed to come up with an approach that was both progressive and workable. “The concept that we came up with is something where we call ourselves ‘venture technologists,'” Utukuri said. As venture technologists, Nytric engineers work to complement the role played by venture capitalists. “When venture capitalists get involved, they are putting out know-how and money. We’re putting in technology, know-how and money,” Utukuri said. “What we do is take new ideas from the concept napkin stage all the way to the front of the store,” he added. Nytric’s support throughout the entire implementation process is enormously beneficial to venture capitalists, Utukuri said, as it eliminates the worry over who is going to govern each step of the process and what the associated costs will be. “What happens when their product is done, or they move on to the next phase of the project, which may be more marketing intensive? They have to figure out what to do with the mechanical engineers who worked on the design for the last eight months,” he said, as it eliminates the worry over who is going to govern each step of the process and what the associated costs will be. “What happens when their product is done, or they move on to the next phase of the project, which may be more marketing intensive? They have to figure out what to do with the mechanical engineers who worked on the design for the last eight months,” he said.